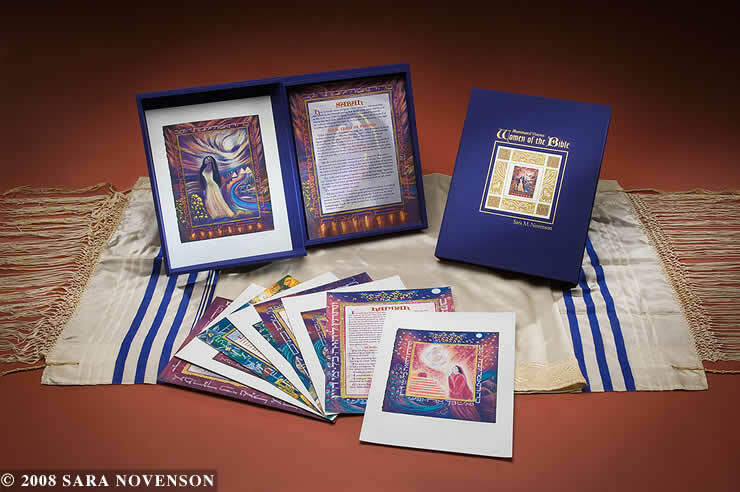 Sara Novenson’s internationally acclaimed series of paintings, Illuminated Visions Women of the Bible, is now available in a very collectable, museum quality limited edition box set. Along with eleven women of the Bible images, the collection includes beautifully designed text pages revealing the brilliant stories of these eleven powerful women. Inlaid on the front of each 13 ½” x 10 ½” x 2” handmade linen covered box is a limited edition print bordered by gold embossed text. Every single page including the text pieces are hand painted limited edition giclees, signed and numbered by the artist. Four of the pages are short stories written by the artist. Within these pages, Sara shares her personal story of the epiphanies and awe she experienced while delving deep into the divine feminine archetypes that were Queen Esther and Sarah.